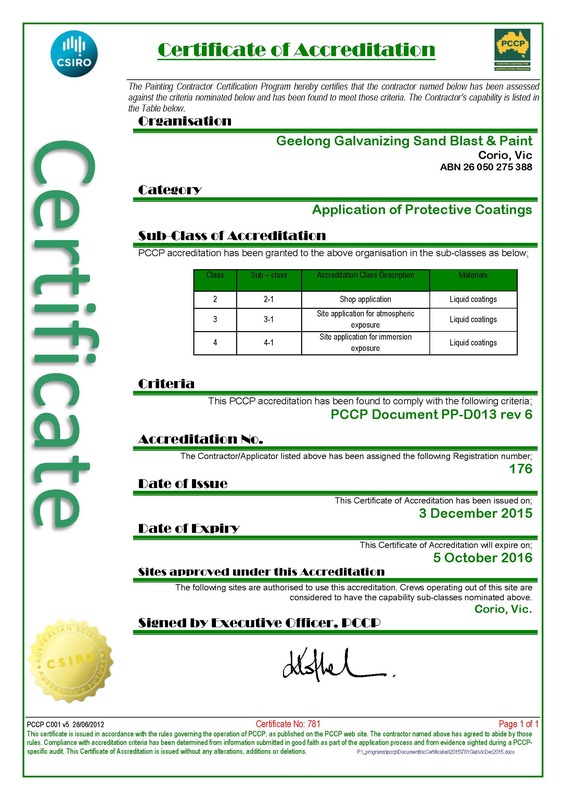 Geelong Galvanizing is now PCCP certified for the application of paint coating systems. The Painting Contractors Certification Program (PCCP) is an independent accreditation program administered by CSIRO. Based on the use of quality and performance standards in paint application, PCCP ensures that only competent, trained and experienced personnel undertake paint coatings. Accreditation is based on compliance to a working quality management system, environmental requirements and OH&S systems that are regularly audited by a NACE accredited inspector. PCCP certification maximises paint protection and minimises the ongoing maintenance requirements of painted assets and infrastructure. Ensure your next painted steel project is contracted to a PCCP accredited supplier.